My favorite spot in the yard has always been the Shade Garden. It is a little island bordered by the road, my driveway, parking area and the neighbors' driveway. Under a canopy of mature firs, I attempted to create a Northwest-style woodland setting with a bit of an Asian flavor. I recall the day ten years ago I planted a single Oregon Oxalis, one of our regional natives. It was cold and my fingers were freezing. Over the years it spread to cover nearly 1000 square feet in two separate areas. It was a joy to behold. At first glance, this photo may seem run-of-the-mill, but it reveals something quite unusual. I have never seen three herons foraging the eel grass beds this close together. Normally, they space themselves along the beach 100 to 200 feet (30-60 m) apart. They seem to carefully avoid intruding into each other's territory while feeding. This gathering may have been an uncomfortable situation for them. The postures of the birds are not relaxed. The extended necks of the two in the water indicate alarm. By the time I had zoomed in for a tighter shot, the bird on the left had flown off. The remaining pair did not stick together much longer. 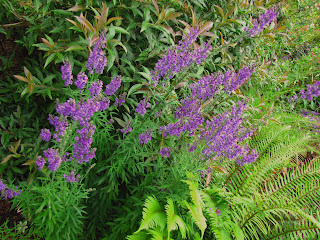 The Mystery Flower posted last week has been identified as Purple Toadflax, Linaria purpurea . 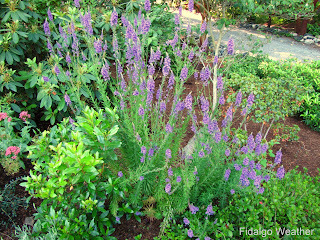 It turns out the flower, a native of Italy, has become naturalized in Washington State, California and British Columbia, Canada. One of the key characteristics is the dome in the center of each little flower shown in the photo below. The flowers look like Sherlock Holmes hats. Two friends stepped up to help with identification. I want to thank both Billy and Malcolm who are responsible for helping me get this mystery solved. Perhaps admitting how pleased I am to get this figured out speaks to my consummate geekdom. I do like to know what the things are that I see around me. As some may be aware, I undertook a fairly extensive makeover of much of the yard last year. In front, I ripped out more than 100 feet of Escallonia hedges and replaced them with perennial beds, ornamental grasses and shrubs. This year, the perennials are starting to come into their own. The splashes of yellow from Daylillies and Coreopsis are turning out especially nice. Every year I plant annuals in containers on the basement patio. It has been a challenge to find attractive plants that are not also craved by the local slugs, snails and rabbits. 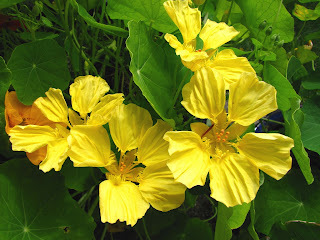 This year I decided to save some money and just stick some nasturtium seeds in the pots. 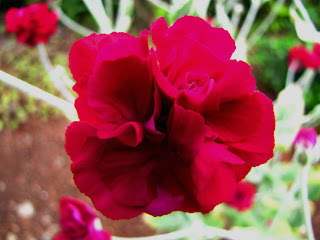 The humble little flower has been the perfect solution; a lush, colorful display with no appeal for mollusc or rodent. This demonstrates the simplest solutions are often the best choices. This cool and cloudy Fourth provides an opportunity to feature three flowers in the garden that might be overlooked at any other time. It is astonishing that a recent poll indicates that 26% of Americans cannot name the country from which we gained our independence. Some of the guesses were China, Spain and Mexico. I sometimes wonder how the British view this day, or if they even think about it at all. Once we got past that little skirmish in 1814 when they burned down the White House, we became steadfast allies. We even share the red, white and blue colors which mark the day. Here is a salute to both America and to our good friends in the UK and the values that we share. There are plants growing in the yard that I cannot identify and that bugs me. This tall perennial flower escaped from the neighbors with several sprouting in a gravel pile I had. That might be a clue to its identity. I moved them to the garden where they have done well. The neighbor thought it was a kind of lavender, but I am skeptical. It doesn't smell like lavender. It fact, it has no fragrance at all. Internet searches have turned up nothing. If anyone knows what this is, I would appreciate hearing from you. While you're at it, can you also identify the leafy shrub behind it? It comes up wild in the yard, has reddish new growth, stays green all winter and has never borne flowers or fruit. None of my native plant books reveal its identity. Somebody out there must surely know what these plants are. I will be grateful to get these mysteries solved. Today, I discovered "Blogger Stats" and what a welcome enhancement it is. As some may be aware, I am new here at Blogger, a refugee from Windows Live Spaces. A wave of updates at Spaces has ruined it as a useful platform. The last straw was the elimination of visitor stats. 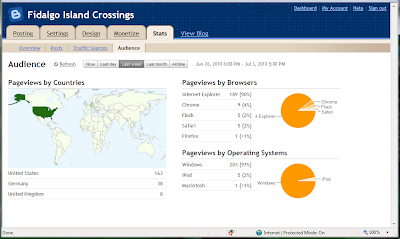 What a pleasant surprise to discover Blogger Stats. If you activate Blogger in Draft, you will find a new "Stats" link in your Dashboard, and a new "Stats" tab in "Settings." It is reminiscent of Google Analytics which I had already added. The advantage is that it is built right into your blog account. It appears that Google giveth what Microsoft taketh away. The previous post from Lighthouse Point seemed incomplete without a photo of the "lighthouse," so here it is in all of its glory. From the perspective of this photo, we now have our backs to the Deception Pass Bridge. Beyond to the west is the Strait of Juan de Fuca. The bridge is the most-photographed structure in the State of Washington. The light is not. Perhaps a grand tower with a lonely keeper would be more picturesque, but not in this setting. The bridge is the star here and that's how it should be.